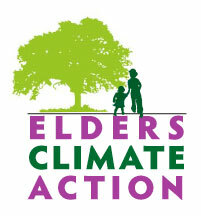 Community Housing Partners and the Climate Action Alliance of the Valley invite you to learn how income-qualified families can get their homes weatherized for free. Through the federally-funded Weatherization Assistance Program (WAP) adminstered by the Virginia Department of Housing and Development (DHCD), Community Housing Partners‘ (CHP) weatherization services reduce energy costs for families by improving the energy efficiency of their homes, while also assessing and eliminating related health and safety issues. The Energy Solutions team completes a site-specific energy audit of a home that includes blower-door-directed air leakage diagnostics, heating system safety and efficiency diagnostics, duct leakage diagnostics, and insulation needs. Following the energy audit, CHP’s weatherization team performs repairs and improvements to home heating and cooling systems and provides for the installation of energy-saving measures in the house, such as improved insulation and air sealing. CHP’s weatherization services are for low-income families, particularly for households with elderly residents, individuals with disabilities, and families with children. Households are typically qualified based on income and recipients must be residents of the state of Virginia. More about CHP’s program here. JMU students Melissa, Yen, Isabella, Max, Jake and Brendan meet with CAAV members Laura Dansby and Joni Grady on February 8. For the spring semester of 2016, CAAV’s efforts to increase home weatherization in the Harrisonburg area through the Community Housing Program-administered Weatherization Assistance Program (WAP) is getting a boost of energy from six JMU interns, self-dubbed the Weather Wizards. Their main goal will be to work on overcoming barriers to spreading the word about and getting homes more energy efficient through the federally funded WAP home weatherizing program which is free for income qualified families. The past year’s efforts have only succeeded in getting work done on six area homes. The Weather Wizards are: Isabella Bauer, Max Florence, Yen Lopez, Brendan Queenan, Melissa Swan and Jake Walters, all taking Dr. Jennifer PeeksMease’s Organization Communication class. More about them below. Among items under discussion are finding out what has worked in other communities, talking to families who have successfully navigated the application process to find ways to facilitate this, and developing an effective flyer as an outreach tool. CAAV welcome’s the talent and energy of these JMU students! solutions that benefit a group rather than an individual. organizational structures and creating ways in which to help them better perform. minor and can use my language skills to benefit the group as necessary. with as well, and look forward to helping my group in any way that I can. solve communication issues that exist around me. assigning roles in addition to conflict mediation. 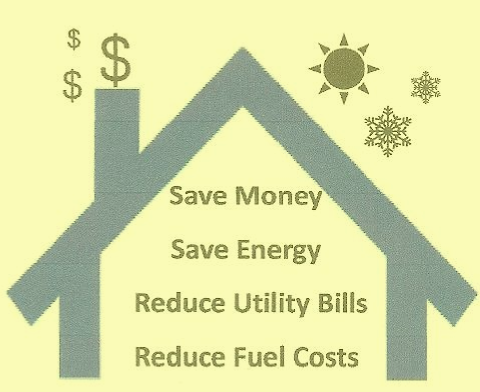 If you qualify* as a low-to-moderate income household, Community Housing Partners can help reduce your energy bills and make your home more comfortable, energy efficient and affordable year round. More here through the Virginia Department of Housing and Community Development website. Pass it on, to family and friends! 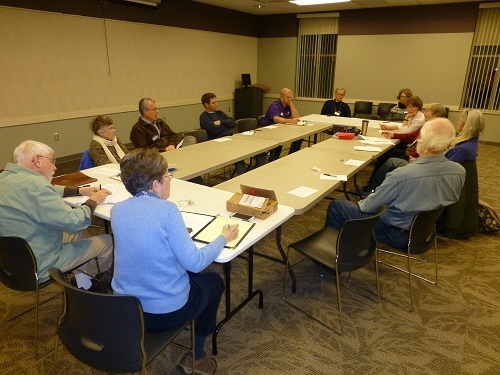 We are helping to plan a Public Meeting with representatives of Community Housing Partners sponsored by the Northeast Neighborhood Association on Thursday, March 26 at 7:00 PM, Simms Center, 620 Simms Ave., Harrisonburg. If you qualify as a low-to-moderate income household, Community Housing Partners can help reduce your energy bills, make your home more comfortable, energy efficient and affordable year round. Clients approved for the Weatherization Assistance Program will receive a free energy audit which will determine the work that can be done in your home. Join the Northeast Neighborhood Association at this meeting with representatives of Community Housing Partners and Weatherize Harrisonburg/Rockingham to learn more and obtain an application. First Meeting on February 26! Our agenda for the meeting is to learn who you all are and where your interests and expertise lie. Are you interested in helping to ferret out all existing weatherization programs and funding sources, whether “official” or volunteer? Do you work with an agency or business or volunteer group already involved in a program ? Do you know groups of people who might be in need of having their houses worked on? Do you have useful contacts with any of the above​ or would you like to develop some? We want to flesh out the list we’ve begun from online sources and add to it with personal contacts, and we​ need your help to gather as much information as we can. Only then can we decide the best ways of making the information available to the people who need it, whether it’s an online website, public meetings, or going door to door–or all of the above. Find our working document of resources here: WHAT WE KNOW and DON’T KNOW about Local Weatherization/Energy efficiency options. Please offer any comments and contributions you may have! We ended the advocacy workshop last month talking about ways to improve the energy efficiency of low and middle income homes in our area. Energy efficiency is the cleanest, cheapest fuel there is. It is one of the cornerstones of the President’s Climate Action Plan. It can save low and middle income families real dollars and let them benefit even more should a revenue neutral carbon fee be put in place. And the feds have been working on it since 1976, almost 40 years! Here in Virginia, Governor Terry McAuliffe signed a proclamation designating October 30, 2014, as Weatherization Day. The WAP (Weatherization Assistance Program) network was also recognized at the Governor’s Housing Conference in Norfolk, Virginia last November. We need your help. The first step is the research and data gathering, an activity a lot of you who came to the workshop were very interested in! We have begun making lists of program/contacts, just as we did at the workshop, but we also need to figure out exactly what information we need to put into the database. And when that’s done, we need people who will gather that information from the online links and then call the contacts to fill in missing information. I know you’re interested in making a real difference in the Valley so join us for an hour to plan and organize. Also, please let us know if you’re interested in the project but just can’t make the meeting. Joy Loving and I have been busily gathering some background information to find out what we know and what we don’t know about the weatherization options available to low and middle income residents of Virginia and Harrisonburg in particular. Please look it over–it’s the Weatherization document on Google Drive –and make any comments (using Review) you might have about people you know, groups that you know, etc. When we do meet, we’ll at least have this as a basis for making a plan for further action and know what blanks we need to fill in. We’ll update it as we continue to find more clues to what we can do and we’ll incorporate your comments appropriately. One overall impression that I have gotten is that Virginia and Harrisonburg are strong supporters of energy efficiency action–as long as the feds are paying for it. Which means that there will be ample opportunity for advocacy as well as local action. We have been asked to attend the NorthEast Neighborhood Association meeting Thursday, February 19 at 7pm at Simms School to introduce what we’re thinking of doing and the information we need from homeowners. I’m excited about the opportunities we have for making even a small difference where we are. Thank you for your support in the last months for the performance contract for the Public Safety Building. Your advocacy, along with others, produced a 3-2 vote on Tuesday night FOR performance contracting on the Public Safety Building AND smaller investments in a few other buildings. My personal preference was to assign the contract directly to ABM as they have twice been selected by CIty staff to provide the best value to the City; however, it became evident to me in the discussion that I may not get the third vote on a motion identifying ABM as the contractor. So, the specific motion approved 3-2 directs the City Manager to pursue performance contracting and report back by the end of July about how to make that happen, including giving performance contractors additional to ABM a chance to bid on the project. Please also note in the discussion (video) that Mayor Byrd, who did not support the motion, did suggest that council could create broad energy savings goals, and hold staff accountable to meeting them. This approach, I believe, is possible strategy to adopt in pursuit of having the city pursue energy and other sustainability goals. This is a major step forward in making this project happen, and I believe the project would not have received these three votes without your advocacy. I hope this is encouraging and motivating for all of us to continue this work. An energy efficiency proposal for Harrisonburg’s Public Safety Building (see Councilmember Kai Degner’s description below) elicited considerable public comment during the April 23, 2013 council meeting. The Council scheduled a work session to address concerns on Wednesday, May 1 from 4-7 at the Council Chambers. The public was welcome to attend but not offered input during the session. According to this May 2, 2013 Daily News Record account by Preston Knight: “At the behest of Harrisonburg residents who spoke in favor of energy improvements during a recent public hearing, council discussed energy savings in its buildings. But the main target for savings — the Public Safety Building on North Main Street — is a freestanding project outside the normal budgeting process, officials say. The budget will come to a vote at the May 14 council meeting before which voters continue to have an opportunity to contact their council members and city manager asking that sustainability measures for the city be funded. “If 100 people contact the City Council and ask for energy efficiency modifications to public buildings and a sustainability coordinator position to be put in the budget, then the Council will have a hard time not doing so. The next meeting is May 14 where the council will vote on the budget. Letters can be sent to: City Manager’s Office, Room 201, 345 South Main St., Harrisonburg, VA 22801, with a request to forward them to City Council. Telephone calls can be made to the same office at 540-432-7701. Faxes can be sent to 540-432-7778. See Tom’s letter to the council and City Manager Kurt Hodgen regarding the “2014 Budget, Energy Efficiency, and Sustainability Coordinator” here. Please read the HR Green Network and Climate Action Alliance of the Valley’s letter to the council and city manager in support of energy efficiency and a sustainability coordinator by clicking here. Austin, TX was able to prevent having to build a new power plant by conducting comprehensive building energy efficiency improvements. See Conservation Power Plant from the film Kilowatt Ours. 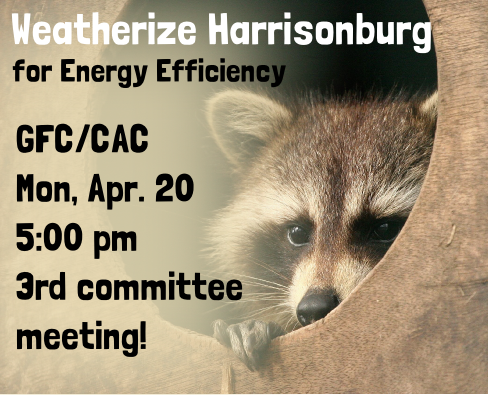 Here in Harrisonburg we have an opportunity to improve the energy usage of some of our public buildings thereby reducing our carbon footprint and saving money. 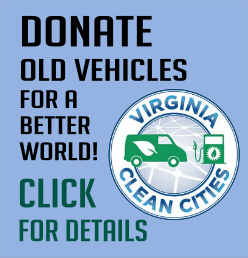 I need your help to help save half a million Harrisonburg tax payer dollars from being wasted in inefficient buildings this year. There are doubts that enough Harrisonburg residents would prioritize this project, so it may not happen. Please read below and plan to attend the April 23rd (Tuesday) City Council meeting at 7PM. Join the public comment session to express your opinion (either way). To learn more, I’ll be at the Artful Dodger at 8pm this Wednesday(4/17) and Thursday(4/18), and at 1pm on Sunday (4/21). The City Council has an opportunity to redirect $100,000+ from annual unnecessary utility costs towards energy efficiency upgrades in the City’s Public Safety Building. The City School Board has their own opportunity to redirect $400,000 of unnecessary utility costs towards energy efficiency upgrades using the same “Performance Contracting” concept. The City of Harrisonburg and Harrisonburg City Schools have contracted with an Energy Services Company (ESCO) to study and implement energy- and water-saving facility upgrades using a “Performance Contracting” approach. Performance contracts are 100% self-funding and are completed within existing budgets – without raising taxes. Basically, borrow money to fix the worst efficiency problems out there, save money on utility costs, and use the annual savings to repay the loan over time. By using the State of Virginia’s Performance Contracting Process, savings are guaranteed for up to 20 years. Savings are measured annually, and, if they fall short, the contractor pays the difference. Based on the study of Harrisonburg’s buildings and infrastructure, major reductions in the City’s operating costs and carbon footprint can be achieved in the Public Safety Building by replacing obsolete and end-of-life equipment, tuning up buildings, training occupants and staff, engaging students with energy awareness curriculum, and diligently tracking the energy usage over time. The costs of these efficiency-related activities in the Public Safety Building is about $2 Million. That sounds crazy expensive, maybe, until you figure we spent $189,000 last year on utility costs for this SINGLE building, and we will again next year if nothing changes. Instead, we could use about $110,000 of those costs to repay a loan to make the improvements. Over 15 years, the City’s savings in utility and operating costs would be $3 Million (factoring in that electric costs increase modestly every year). Incidentally, the school’s proposed costs would be a seemingly-whopping $6.5 Million – but they stand to save $8 Million over 15 years. For those concerned with carbon: together, the annual CO2 reduction is 3,745 Metric Tons (equivalent to electricity for 561 homes every year for 15 years or equivalent to taking 700+ cars off the road for a year every year for 15 years). For those concerned with economic development: we are trying to designate Harrisonburg as an “innovative” community. What’s innovative about blowing half a million tax dollars out of inefficient buildings? Let’s instead redirect this tax payer money into sensible infrastructure improvements. For those concerned about politics: performance contracting is supported by the Republican-controlled Virginia government, and has been supported by both Democratic and Republican governors. Harrisonburg utilized this process in 2009 to reduce energy consumption at the Community Activity Center at Westover Park (some of you might remember this success story presented immediately after we approved $1 Million for bicycle infrastructure this past Fall). It worked, even better than predicted. I believe we should do it again, but I don’t think there is enough public support to guarantee it will happen. Will you attend Tuesday’s Council meeting and speak in support of the Performance Contracting for the Public Safety Building? Your attendance at the meeting and other communications (or lack thereof) can help influence this decision. I’ll be at the Artful Dodger 8pm this Wednesday and Thursday and at 1pm on Sunday (April 17, 18, 21) if you want to learn more. Thank you for all you do to make Harrisonburg a great place to live.